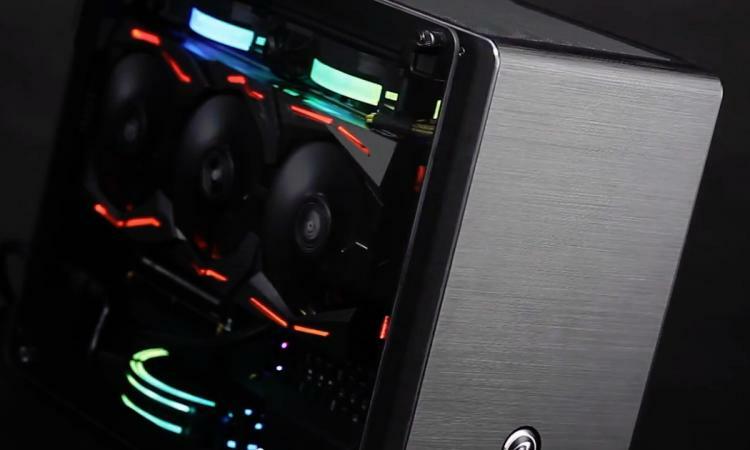 Raijintek are past masters at creating premium PC cooling solutions, whether they be high-end air coolers or top-quality chassis, but it's been a little while since they released a new product on the market. 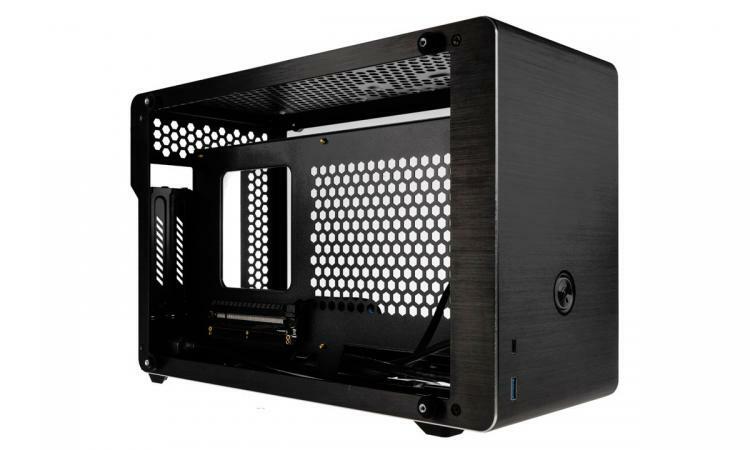 Finally however the wait is over as this week they present the new Ophion mini-ITX case series for small form factor systems. Starting at £119.99, the Ophion and Ophion EVO offer a wide range of premium features in a restricted footprint, ensuring that even high-end performance wouldn't be beyond your reach. Looks too remain a factor; both versions of the case come with brushed aluminium fascia and two tempered glass side panels, potentially matching internal component quality to refined external looks. Internally, full-length dual-slot GPUs up to 330mm are supported, as are standard ATX power supplies (although modular PSUs will continue to offer the best looks for your system). The motherboard is mounted vertically, while the GPU is mounted behind the motherboard - hence the need for two transparent side panels and bundling of a PCIe x16 riser cable. Furthermore, the Ophion EVO can support AIO cooling solutions with up to 240mm radiators despite the case's narrow overall width of just ~17.5cm. Building on the above, the Ophion also adds a little bit of convenience in the form of front USB 3.0 and a USB Type-C connector. Conveniently located low to the floor, they provide an element of future-proofing too by not restricting you to USB 3.0 alone. Storage options are a little more restrictive, but reflect the changing priorities of PC users: there is space for a single 3.5" HDD, or three 2.5" SSDs. Given how HDDs have fallen out of vogue now that SSDs are so competitively priced, this seems to be a sensible compromise. 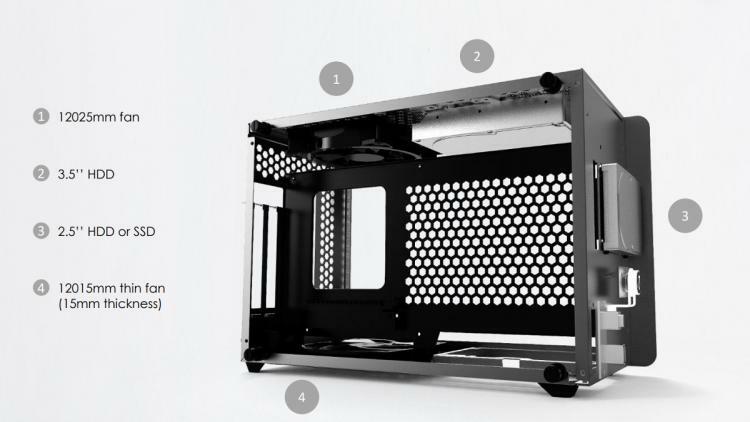 The chassis can accommodate CPU coolers up to 85mm tall, two 120mm fans on the top, and one 120mm fan at the bottom. The latter emplacement only supports fans up to 15mm thick though, so note that in your purchasing decisions. AIO liquid coolers aren't officially supported. Ophion EVO takes the base Ophion and adds just a little bit more to the mix, starting with size. 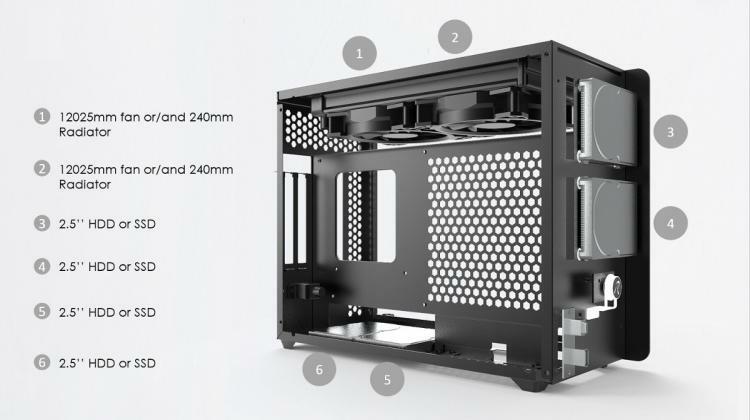 And extra 45mm of height clearance allows users to install AIO CPU coolers more easily, with radiators up to 240mm in size. The bottom too has slightly more clearance; there's space of a 25mm thick 120mm fan now. We'd expect that it's also inherently a little more easy to install components into generally, as is often the case with tiny and slightly larger small form factor systems. The other major changes are compatibility with slightly taller (90mm) CPU coolers, and four rather than three 2.5mm SSDs. But really, the major difference is in size (and hence aesthetics) and cooling support. 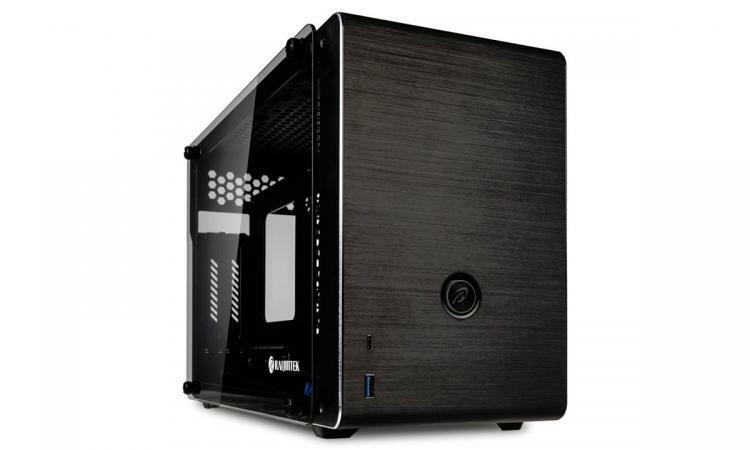 The Raijintek Ophion is available to pre-order today in the UK priced at £119.99 inc. V.A.T., while the Ophion EVO is just a touch more at £129.95 inc. V.A.T. Both can be pre-ordered at those prices today from Overclockers.co.uk; more information and images are available at Raijintek.com.